At here, I don't want to tell more about what is iStick TC 40W, if you really want to know, or you can visit our other articles in this blog or visit it's product page: http://www.eleafistick.org/istick-tc40w.html. You know, the original price of iStick TC40W is $54.99, but at Eleaf official authorized online store, you just only pay $39.90 can get it. what are you waiting for? Another good News is you can buy iStick TC 40W with GS-Tank Atomizer Starter Kit, just only $49.90, you know the original price of GS-Tank Atomizer is $28.9 , and it sold at iStick.org only $17.9. But now, if you buy iStick TC 40W and GS-Tank Atomizer at the same time, you can save $33.99 (54.99+28.9-49.9) at iStick.org. if you separate purchase any product of them, you also can save money at here, but not so affordable. 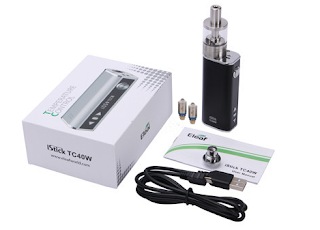 Strongly recommended buy iStick TC 40W with GS-Tank Atomizer Starter Kit, you can save much money!